2 What Are Yellow Potatoes? The volume of starch in a potato determines its texture and the types of dishes for which it is best suited. High-starch potatoes, which are mealy or fluffy, are good baked and, when mashed, light and feathery. Medium-starch potatoes, called "all-purpose" potatoes, have moderate levels of starch and moisture, making them suitable for most potato recipes if they're not overcooked. Low-starch potatoes, also called "waxy" potatoes, hold their shape well even after boiling. 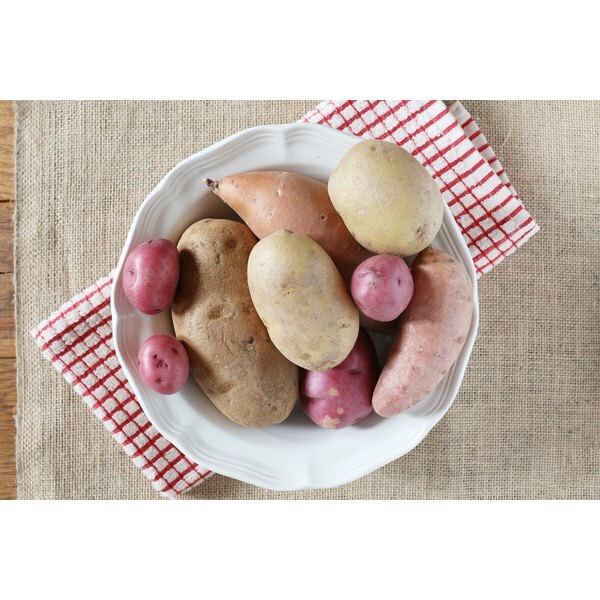 Small 1- to 2-inch potatoes that are easy to cook and serve whole typically have the lowest levels of starch. Waxy, low-starch spuds are your best choice for potato salad, and they yield creamier mashed potatoes than all-purpose or starchy varieties. A new potato is typically just a young white- or yellow-fleshed potato. Red-skinned new potatoes work well for potato salad and heavier mashed potato recipes. The various fingerling potatoes are also small, waxy potatoes, often used for roasting and boiling. The Yellow Finn potato has golden-tan skin and superior flavor. It shines in roasted potato recipes, with simple seasonings such as olive oil, herbs and spices. Medium-sized, white-fleshed potatoes, such as the Kennebec, are suitable for frying, mashing, boiling and even grilling. The Yukon Gold has golden skin and flesh; it is a reliable choice when you need to boil, steam, or roast a potato. Grilling a Yukon Gold gives it a sweet, slightly caramelized flavor. 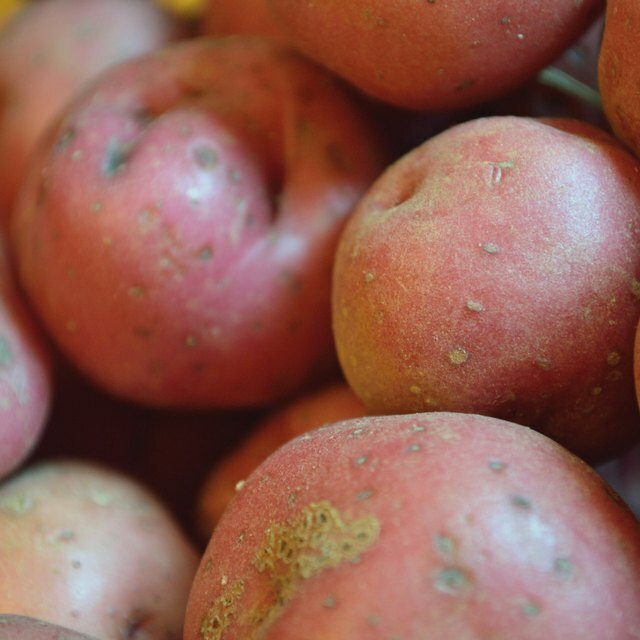 Larger red-skinned potatoes, such as the Norland, Red Pontiac and Red Gold, have moderate levels of starch when they are mature. They work well in roasted and pan-fried dishes and yield creamier mashed potatoes than starchy spuds. Blue and purple-hued potatoes are also all-purpose; cooks generally roast them or feature them in potato salads. Take care not to over-mash starchy potatoes, which can make them pasty. High-starch spuds are not the best option if you are boiling potatoes and want them to retain their shape. They are naturally dry, so they absorb water easily, which causes them to fall apart when you boil them. They are suitable for frying, however, because drier foods fry more crisply than moist foods. The ubiquitous brown russet potato -- or Idaho spud -- is a high-starch potato. Sweet potatoes are high-starch potatoes that contain more sugar than white-fleshed potatoes. They work well in the same types of dishes as other starchy potatoes. But sweet potatoes typically have a creamier, less mealy texture than their high-starch counterparts because of their sugar content. They are excellent baked, mashed or fried. The Japanese sweet potato (which has a red exterior) and Hannah sweet potato are two other prominent varieties.